I’ve been rolling out a few recent changes on the Alphabet Now applications. Most notably, you may have noticed an improved layout in the lessons section that shows mini-flashcards for the letters or symbols, first focusing on teaching the symbol names and then, as a second step, the pronunciation. By breaking this down into these steps, I’ve found it to be a more effective learning method. Less visible, the quiz function logic has been improved and overall management of the application development has changed. This will allow for better support and new development to be rolled out faster. 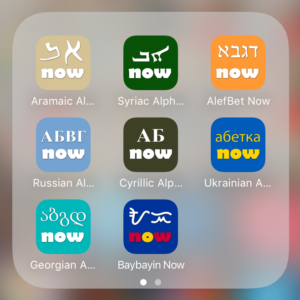 The apps now updated include the Cyrillic group (Cyrillic, Ukrainian, Russian), Hebrew, Greek, Georgian. This is also an opportunity to let me know which writing systems you are interested in so that I can consider them in the development plan. What language script are you interested in? Are you interested in specific minority or endangered language writing system?